Submitted by Alexander Briones on Aug. 9, 2018. Original photograph by Justin Higuchi, modified by Jason Horton and available under Creative Commons license. This guide was first published on August 30, 2017, written by Mason Hoberg and last updated on August 9, 2018 by Alexander Briones. Anyone who has ever gigged with an acoustic guitar can tell you what a lifesaver acoustic pickups are. The days where guitarists had to carefully positions their instrument in front of a microphone are long gone, because acoustic-electric guitars have become plug and play instruments. If you're on a limited budget, then you might like to also look at our guide to Cheap Acoustic Electric Guitars Under $200. One look at its distinct bowl-back body, and you already know that the Ovation Applause Elite AE44II is not your average wooden guitar. This distinct back is crafted from Lyrachord, the same material which is said to be used in helicopter blades and more. This results in a lightweight instrument that's not as fragile as wood. Still it does come with a solid spruce top and other wooden components, so it doesn't sound or look too out of the ordinary. Finally, the guitar comes equipped with an undersaddle piezo and preamp system, which features a 3-band EQ and built-in tuner. Reviewers have mostly good things to say about the Ovation Applause Elite AE44II. Most of which are happy with its overall value and playability. It also helps that the guitar is pleasant to look at. Even Premiere Guitar's Shawn Hammond is impressed with its "super-solid build and setup", concluding that this guitar is a fantastic deal. There are a few users who comment on minor aesthetic issues, but they still like the instrument overall. There are some who report that bass response is a bit lacking, but this is to be expected given its bowl-back mid-depth profile. Speaking of bowl-back, there are a few who feel that it may take some time to get used to its distinct body shape. If you're looking for an affordable acoustic-electric guitar with good functionality and increased reliability, then this is for you. While generally associated with rock and metal, Ibanez has always had a great lineup of acoustic instruments. A notable line produced by Ibanez is the Artwood series, which has combined old world craftsmanship with modern manufacturing to create some pretty solid entry-level guitars; a great example of which is the AW54CEOPN. 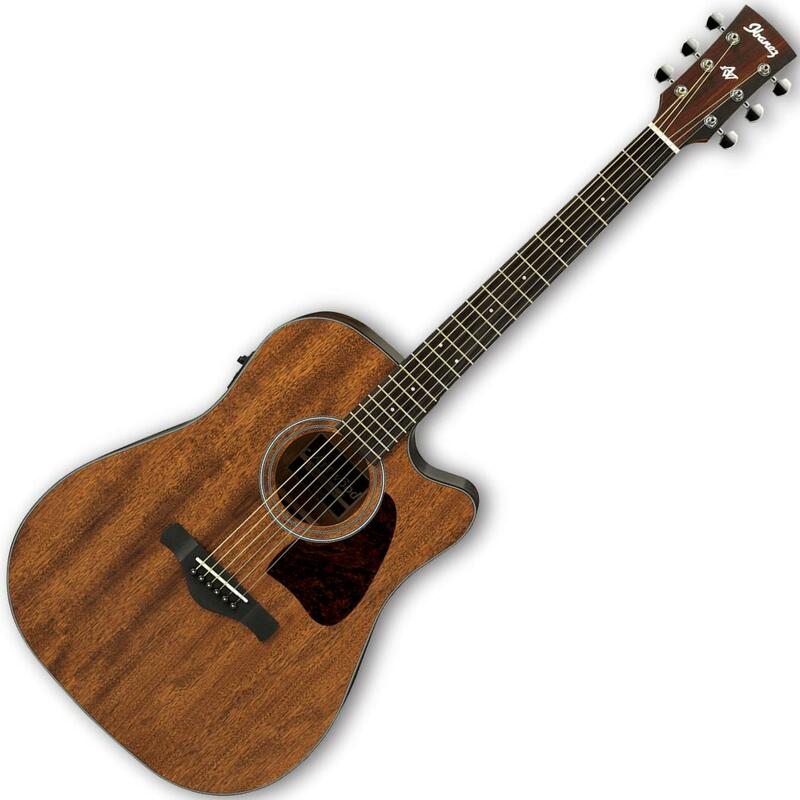 While the Ibanez AW54CEOPN is an acoustic-electric guitar, the main focus of its design was its acoustic tone. The guitar utilizes an open pore finish, which is intended to allow the guitar to resonate more freely by minimizing the amount of finish applied to it. It’s hard to say how effective this is in practice due to the guitar’s laminated back in sides, though there doesn’t seem to be any widespread complaints about the guitar’s tone. The Ibanez AW54CEOPN sports an active Fishman preamp and pickup system, which performs admirably for a guitar in this price tier. It’s not mind blowing by any means, but it’s definitely serviceable for small gigs and open mics. The pickup sports controls for bass, treble, and volume as well as a tuner. As expected from a guitar made by Ibanez, playability gets a lot of positive attention. Many are impressed with the feel of the neck and fingerboard, and some are more than satisfied with its out-of-the-box setup and string action. The AW54CEOPN's tone also gets a lot of thumbs up, along with the overall build quality of the guitar. There are a few who gave lower ratings because they had to adjust the string action lower. The unplugged sound of this guitar emphasizes the bass - which can be good or bad depending on your taste, and this is reflected on some of the reviews. If you're looking for a fun to play acoustic-electric guitar with a warmer tonality, the Ibanez AW54CEOPN is highly recommended. Yamaha is well known for the quality of their mass produced and affordable guitars, and they continue to be the brand of choice for students and even for teachers. The Yamaha FGX800C is tasked to represent brand in the sub $300 price range, and judging from reviews, it is doing very well in the market. Everything about this guitar is conventional, from its familiar dreadnought cut-away shape to its comfortable neck and string action. It also comes with built-in electronics that give you 3-band EQ control and a tuner. But what makes this guitar a bit more special is the use of solid spruce with scalloped bracing for the top, which ups the value of the instrument. The Yamaha FGX800C gets a lot of thumbs up from users who are happy with its sound and value for money. This also includes parents who bought their children this guitar to practice on. Playability is also commended often, along with its solid top build. There are some concerns raised about its playability, but even those who gave slightly lower scores are happy with their purchase. Hard to go wrong with a Yamaha if you're looking for a guitar in this price range. 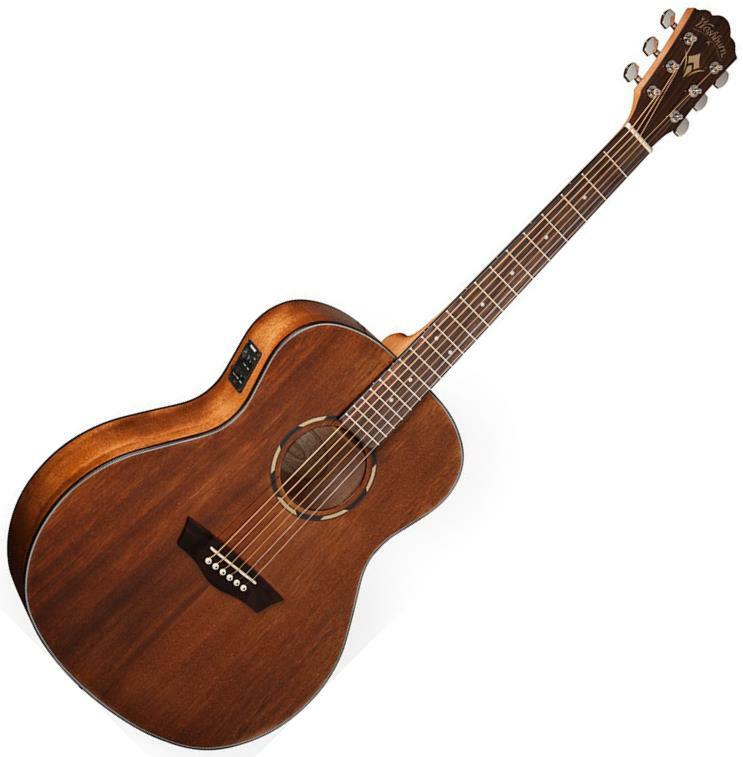 The AEG12II-NT combines a thin body profile with Ibanez' brand of playability, resulting in a comfortable and easy to play acoustic-electric guitar. It features an all-mahogany body with a narrower depth that makes it easier to carry around and to play with. The downside being is lack of low end and projection - which can also be a good thing if you prefer acoustic tones with more midrange. Giving this guitar its amplified voice is a Fishman Sonicore pickup, which is paired to an AEQ-SP1 Preamp that also comes with a tuner. And since Ibanez is not one to skimp on aesthetic features, you get a really good looking instrument with distinct fretboard inlays, bindings and more. Nice and great are just two of the many positive adjectives that people use to describe the Ibanez AEG12II-NT. And most of these satisfied users are pleased with its playability, describing it as a truly inspiring and fun instrument. Its visual appeal and sound quality are also commended often, some even coming from experienced players who compare it to more expensive acoustic-electric guitars. Not many complaints about performance, but there are a few reports of minor blemishes. Those who are used to big body acoustic guitars also note that the guitar's thinner body profile may need some minor positioning adjustments. The Ibanez AEG12II-NT is ideal for those who are looking for a compact workhorse acoustic-electric guitar. The Ibanez AEG10II is a thin-bodied acoustic-electric guitar, designed with a focus on live performance as opposed to amateur recording or practice. The AEG10II combines laminated spruce top with mahogany back and sides, and packs both in a thin profile body. Thin bodied guitars, while more resistant to feedback than their larger counterparts, don’t have the breadth of tone or the volume of a full sized acoustic guitar. The cool thing about this guitar is that, it’s one of the cheapest ways for beginning musicians to get a solid gigging instrument. When you’re just starting out you generally play in less than ideal conditions and your soundman, if one is present at all, isn’t going to be as well versed in his/her craft as someone who works in larger venues. Because the guitar is resistant to feedback and gives you the option to sculpt your tone without having to rely on a console, it will prove to be a valuable asset. Good looks and playability seem to be the two biggest selling points of the Ibanez AEG10II. Many describe it as a fun instrument, thanks to its comfortably thin profile body and fast action setup. A good portion of its positive reviews are from users who after gigging with the guitar, have great things to say about its reliability and amplified sound. There are a few who complain about its thin profile body and the resulting limited acoustic projection. There are also some who had to make action adjustments before they enjoyed the guitar. With its thin profile body and Ibanez brand of playability, the Ibanez AEG10II is truly a fun instrument that you can take with you on stage. 95 out of 100. Incorporating 250+ ratings and reviews. 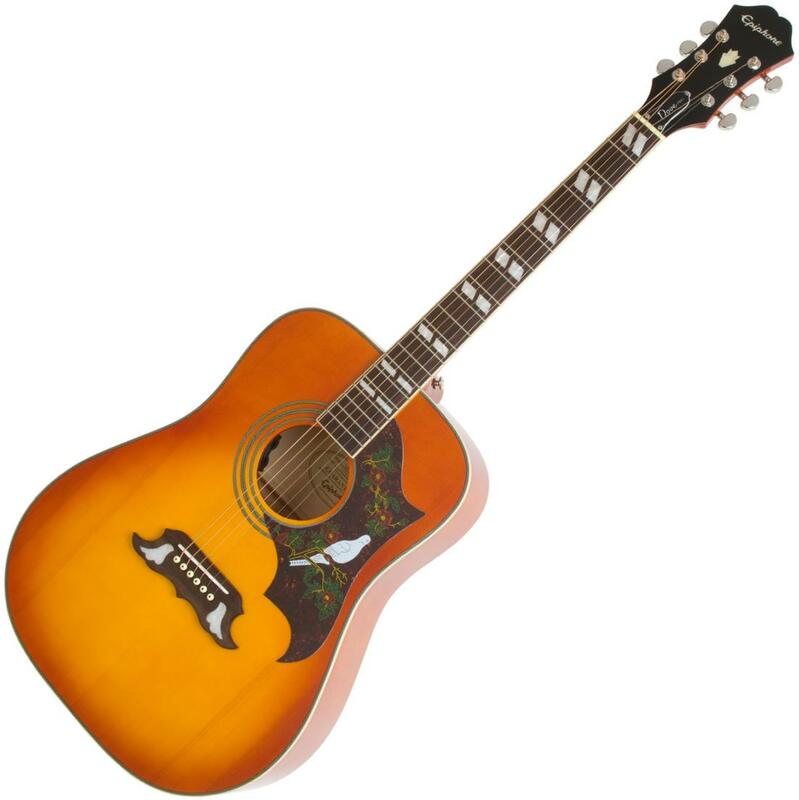 The Epiphone Dove Pro is a reproduction of the classic Gibson Dove guitar. While it is unfair to expect it to have the same high-end specs and tone, it does impress enough guitarists to warrant a spot in this list. At its core is a combination of solid spruce and maple, which gives it a subtly brighter tone when compared to conventional spruce and mahogany body acoustics. To retain as much of the guitar's acoustic body as possible, Epiphone equipped the Dove Pro with discrete Fishman electronics, with controls that are mounted on the underside of the sound hole. The Epiphone Dove Pro continues to work its old school magic into the hearts of guitarists, new and experienced alike. Its classic styling seems to be a major part of its appeal, as most reviewers attest to. Value for money comes in as close second, with many satisfied that they are getting a great looking solid guitar at a very justifiable price point. It is used in many different musical styles, including country, folk and even rock. While there are many who appreciate its discrete electronics, there are a few who feel that it is too limited for stage use. As expected of guitars in this price range, there are some who made minor setup adjustments to better enjoy the instrument. With its classic styling and long standing legacy, the Epiphone Dove Pro is a good affordable acoustic-electric to add to anyone's guitar collection, be it a beginner or a pro. 93 out of 100. Incorporating 20+ ratings and reviews. The Gretsch G5024E easily stands out from other acoustic electrics with its triangular soundhole and stylish pickguard. It carries over Gretsch' brand of eccentric design for acoustic players to enjoy at a very affordable price point. And it's not just about looking different because it does follow conventional acoustic guitar builds with its solid spruce top, scalloped X-bracing and laminated mahogany back and sides. For plugging in, it comes with the Fishman Sonicore under-saddle pickup and Isys+ preamp system, which comes standard with many acoustic-electric guitars in the market. With its playful old school appeal, many consider the Gretsch G5024E as a fun instrument to practice and perform with. Build quality and aesthetics are often cited in reviews, with many reports of the guitar eliciting positive response from friends and audiences. There are also reports from users who are very happy with both its amplified and acoustic sound. There are no standout complaints, but I can understand how some will skip on this guitar simply because it doesn't look like traditional acoustics. If you want an eccentric workhorse guitar to match your style, then the Gretch G5024E may be a good match for you. 94 out of 100. Incorporating 20+ ratings and reviews. Washburn continues to make waves in the entry to mid-tier acoustic guitar market, and the Woodline WL012SE exemplifies why - with its balance of premium features, build and value for money. It features a solid mahogany top, supported by laminate mahogany back and sides, which gives a warmer tonality and a very earthy vibe. It also comes with Graphtech NuBone nut and saddle, a premium feature that you normally have to pay extra to add into your guitar. Giving this guitar its amplified voice is a Fishman Presys II 301T electronic pickup/preamp system that comes with a built-in tuner. On top of all that, the Washburn WL012SE does not skimp on ornamentation, which includes the Washburn Parquet rosette and rosewood bindings. Wonderful and excellent nicely summarize how the market feels about the Washburn WL012SE. Many are impressed by its solid build, while others are into it for the aesthetics. It also gets plenty of love for its build and sound quality. Even experts like Ed Mitchell of Music Radar have mostly good things to say, he concludes his review with this statement: "The WLO12SE is a beautifully realized reminder that you should take the time to narrow your search and find a playing experience and tone that suits your needs perfectly." Hard to find fault with this guitar, but those who prefer the open and punch sound of spruce top guitars may not connect well with the WLO12SE's warmer tonality. 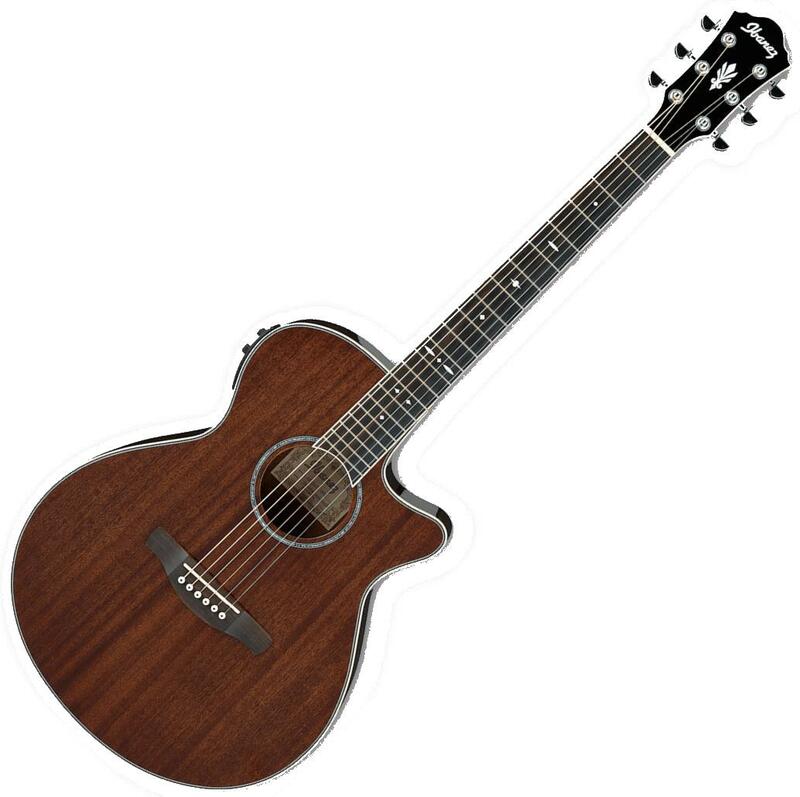 With its great features and continued positive reception in the market, the Washburn WLO12SE is highly recommended for those who want a nice looking all mahogany acoustic electric guitar. 94 out of 100. Incorporating 30+ ratings and reviews. The S6 Classic continues to be among Seagull's most popular guitar offerings, and rightly so with its considerable quality to price ratio. It is a great introductory instrument that showcases their brand of craftsmanship and quality control. Visually, what sets this guitar apart is its distinct headstock shape, but there's more to this guitar than meets the eye. Firstly, the guitar's top is crafted from solid cedar, an interesting wood choice because this type of wood is more commonly used on nylon string guitars. The warm tone of cedar matches nicely with the bright sound of wild cherry, a staple tonewood used on the back and sides of most Godin guitars. This combination gives the instrument a more distinct appearance and sound. Other features that don't follow the usual convention include the use of maple for the neck, and its B-Band M-450 T preamp system. Market sentiment is overwhelmingly positive, with many reviewers describing how the Seagull S6 Classic M-450T exceeds their expectations. Build quality and playability gets the bulk of commendations, along with its clear sound and good acoustic projection. Some even dare to compare the Seagull S6 Classic with super expensive guitars from major brands. Since there aren't that many complaints about this guitar, I'll just point out that I am not a fan of their narrow headstock design, but it does make it easier to spot. Be it for starting your guitar journey or for expanding your existing arsenal of instruments, the Seagull S6 Classic M-450T will exceed your expectations. This one is priced slightly over $500 but it's getting rave reviews so it's worth taking a look at if your budget can stretch a little further. 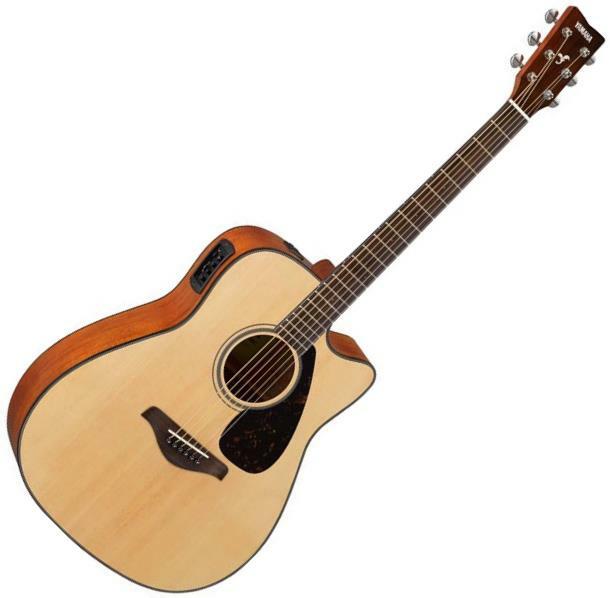 The Takamine GD71CE is a feature packed acoustic-electric guitar, with its solid top construction, visual embellishments and improved electronics. Takamine equipped this guitar with a solid spruce top and rosewood for the back and sides - a nice tonewood combination known for its articulate sound. It also comes with matching aesthetic appointments that include maple binding for the body, neck and headstock, abalone rosette, rosewood headcap, maple dot inlays, gold die-cast tuners with amber buttons, and the body is wrapped in a nice looking gloss finish. In addition to all this, the Takamine GD71CE is equipped with their TK-40D preamp system which gives you more control over your amplified sound with its mid contour switch, 3-band EQ with bypass and notch filter. Playability and tone are two of its most commended traits. Many describe its neck as very easy on the hands, while others describe the overall playing experience to be better than their other acoustic guitars. The TK-40D preamp gets a lot of nod from users who want to fine tune their amplified sound, while there are also many who are satisfied with its acoustic sound. Other than a few who are looking for more low end from its acoustic voicing, the Takamine GD71CE continues to get positive responses. Looking for a mid-tier acoustic-electric guitar with premium level electronics and embellishments? This is the guitar to check out. If after reading through our recommendations you’re still not sure which guitar will work best for you, go ahead and read through the sections below. The main thing to remember about different types of acoustic guitar pickups is that none of them are inferior to the other, they just have different strengths and weaknesses. They’re all also available in different price tiers and levels of quality, so don’t discount any acoustic guitar pickup out of hand. There are three main types of acoustic guitar pickup, first of which is the piezo pickup, and this is the most common type in production acoustic-electrics today. The other two main types include magnetic, and transducer. For ease of reading they’re laid out below. The term piezo refers to the use of piezoelectric crystals that transfer vibrations into an electric current. Piezo pickups are inexpensive to produce, and as such are the most commonly found pickup in acoustic-electric guitars. Piezo pickups generally have a bright tone and strong mid-range response, thankfully they are bundled with preamps that help make the sound more like an unplugged acoustic guitar. While there's nothing better than a true miked acoustic tone, sound quality of piezo preamp system's have steadily been improving, which is good for both guitar players and manufacturers. Contrary to popular belief, magnetic pickups are used on both acoustic guitars and electric guitars. These pickups sit in the sound hole of a guitar, so they don’t require any drilling or permanent modification. They’re also commonly an aftermarket addition (the John Lennon signature guitar is the only exception to this trend that springs to mind). These pickups have a more metallic sound than either a piezo or a transducer pickup, though high-end models generally produce a better approximation of an acoustic tone. Transducer pickups are considered to be the best option available if you’re looking for an authentic acoustic tone. They have a very rich and complex tone, and retain the general flavor of your guitar’s voice. The only flaw with this pickup type is that it produces more feedback than either piezo or magnetic pickups. Something to keep in mind when looking for pickups is that you’re going to have to choose between an active or passive pickup system. A passive system simply transfers the signal from your strings to whatever you’re using to amplify it, while an active pickup boosts your signal through the use of a battery. A passive pickup doesn’t produce a very strong signal, which can result in a small amount of volume and an anemic tone. However, the signal can either be boosted at the p.a., your amp, or the most versatile option' via an Acoustic Preamp. Active pickups don’t require any external technology to boost, though they do require a battery, but some people still use acoustic preamps for the tone shaping and DI benefits..
There’s a lot of debate surrounding tonewoods, so we’re just going to list the basic qualities of those you’re most likely to encounter. Spruce is the most commonly found top wood on a guitar (the side which faces out while you play). It has a bright tone that’s well suited to strumming or fingerpicking, especially when paired with mahogany. Mahogany emphasizes bass and mid-range frequencies, and as a general rule has a fairly dark tone. Koa, another commonly found tonewood, is very similar to mahogany. Rosewood is brighter than mahogany though not as bright as spruce. When paired with spruce the resulting tone is very bright and focused, making it well suited to lead and fingerpicking. Cedar is also used as a top wood, though it’s most commonly found on classical guitars. Cedar is great for mellow fingerpicking and strumming, though it’s not the best choice for more lively genres (blues and bluegrass). The difference between laminate and solid wood is that laminate is several thin sheets of wood glued together, while solid wood is a solid piece of wood. The glue that binds the pieces of laminate together reduces the amount that your guitar vibrates, which in turn lessens your volume and frequency production (tone). Solid wood resonates more efficiently, so instruments that use it are louder and sound better. On the flipside, laminated woods are cost effective, reliable and resilient to weather changes. We took another detailed look at all acoustic-electric guitars priced under $500 available from major American online retailers, and for this update, we shortlisted 78 of them for closer analysis. We then collated over 7700 ratings and reviews from forums, videos, retailers, blogs and major music gear publications and processed those data with the Gearank Algorithm to produce a Gearank score of out 100 for each guitar. Finally we selected the highest rated guitars in two of the most popular price brackets, sub $300 and sub $500. For more information about this process see How Gearank Works.